Cleaning up after the job is done is something that is often overlooked, but sweeping away debris and dust are essential for both safety and workmanship. The best push broom for the money will depend on what you’re cleaning up as well as how you plan to use it. To pick up fine dust and debris, the bristles of the broom need to be pliable and soft, but picking up sawdust or sand means you need bristles that a bit more coarse. Durability is also a concern, as push broom have to be able to take heavy usage without the bristles falling out or the handle bending or breaking. Fulfilling requirements like this is part of what makes the top rated push brooms stand apart. 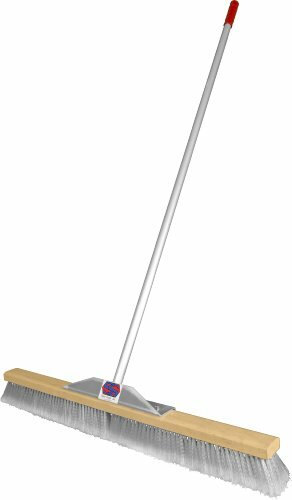 The Super Sweep is one of the toughest push brooms you can buy. You will like the lightweight aluminum handle that does not wear you down but still stands up to heavy work. If dust or powder are a cleanup problem, the soft bristles of the Super Sweep will make the task easier for you, and that equates to saving you time. 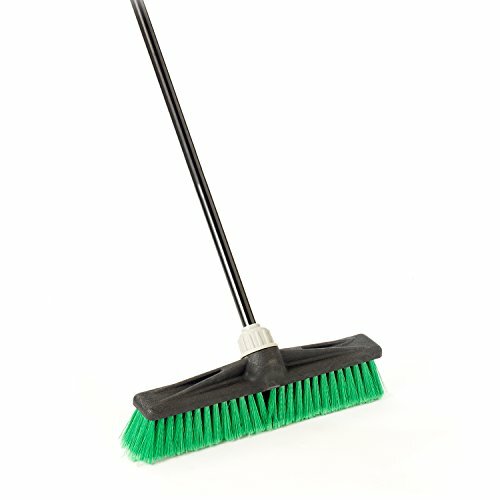 It’s one of the most durable push brooms on the market, which means that you won’t have to replace it every few months. It is ideally suited for smooth floors, but will work well on semi-smooth surfaces as well, and you can use it on almost any type of hard flooring. Combined with a shop vacuum, you’ll make quick work of garage cleanup. The only real drawback is that you have assemble the Super Sweep yourself. It’s not really a big deal but some prefer having the broom ready to go. You will have better luck with the assembly if you install the inner screws first, as they can be tough to get to after the broom has been partially assembled. Keep in mind that the Super Sweep is 3 feet wide, and not designed for cleaning up in confined spaces. Sometimes you don’t need a 3-foot wide broom, especially in close quarters. This O-Cedar model is one of my favorites for quick sweeping in the garage, wood shop, or even prep for deck refinishing. The best feature is its anti-rotation socket which keeps the broom head nice and tight with the composite handle. Like others, it has soft outer bristles combined with tougher inner bristles to sweep away fine particles such as sawdust or heavier debris such as that canister of screws you accidentally dropped. While one of the best values in push brooms, it’s not perfect. While the socket keeps a tight connection for the most part, after heavy sweeping, you may need to re-tighten it. Also, with an 18-inch broom head, it will take longer to clean up larger areas. While it’s not necessary, it’s a good idea to get a couple different sizes of push rooms for various tasks. 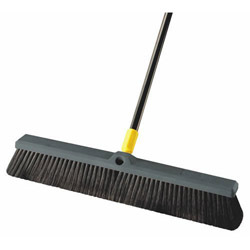 Another great push broom by O-Cedar, the 24-inch model is made specifically for smooth surfaces. Its soft, high-quality bristles will easily pick up dust or sawdust on your garage floor or on wood and tile inside the house. 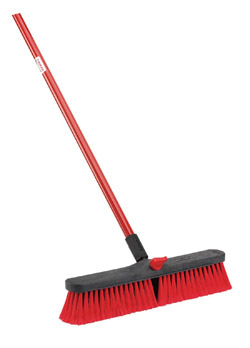 The O-Cedar broom offers the same anti-rotation socket as the 18-inch general use model above. If you’re into woodworking, this is one of the best investments you can make for easy cleanup. While it’s great for fine particles, you’ll need to look elsewhere if you need to sweep heavier debris such as gravel. For cleaning up heavy debris, the Libman Multi-Surface Push Broom is an excellent broom. The broom head has double screw-in holes for attaching the handle at different angles, and includes a handy plug for the unused hole that prevents clogging and helps secure the head while you are using the broom. This broom is heavy though, so be prepared for it to provide a bit of a workout if you are cleaning up a large area. Unlike the Super Sweep, the Libman push broom bristles are more coarse, so you can move larger sand and grit, but it may not do well for powder and dust. It’s perfect for collecting kitty litter that you used to soak up an oil spill in your driveway. If you need an all-purpose push broom for your shop or garage, a Libman broom is just what you are looking for. Right off the bat, the biggest advantage of the Quickie Bulldozer is the light weight. 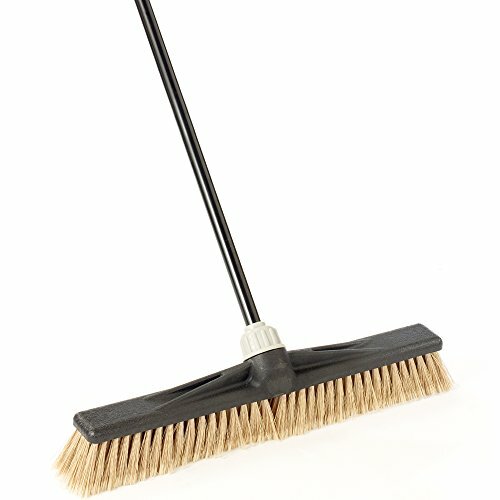 If you have a large garage that needs to be cleaned up regularly, this broom is wide enough to do the job, and light enough for you to handle it with ease. It has softer, split-tip bristles than most push brooms, but they are still coarse enough to pick up larger debris as well. The handle is not as durable as the Super Sweep’s, but it is still strong enough to stand up to moving heavy loads of sand when it has to be done. If you primary use will be cleaning up dust or medium grit sand, the Quickie works as well or better than either of the other top rated brooms, but it is not as durable as you might want. Soft bristles are not appropriate for every cleanup job, so be sure to select the right type of broom head for your most common needs. Love my Super Sweep! Ended up getting the 30″ though since I have a smaller garage. Not sure why I didn’t get a push broom years ago.